Transfer Rubber Molding Machine offered comes designed and developed using advanced technology support so as to offer process support involving vulcanization of rubber strips joints. Further, the press is designed to deliver high overall structural rigidity and low jaw opening elastic deformation. Some of its features include coming with right and left hydraulic clamping support for easier operations, PLC based automatic controls of entire cycle, helps in reducing labor intensity, is low investment, providing for quick performance support among others. 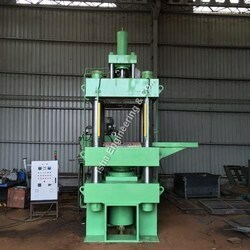 We are offering Transfer Rubber Moulding Press of best in industry. The press has precisely honed carbon steel seamless tubes, assembled with hard chrome plated piston rods and sealing elements of EN-9 & international standards. Manifold blocks are mounted on valves minimizing piping, leading to no leakage & easy replacement & maintenance. We are engaged in offering Rubber Molding Machine that are used to check the rubber bond strength of metallic bush with rubber molding. 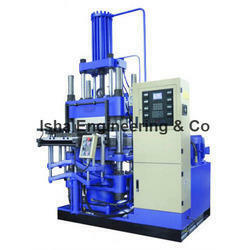 Fabricated in compliance with established industrial standards, the machine caters various industrial requirements. The features associated with our molding machines are optimum performance, longer shelf life, low in noise level and power consumption and easy to install and operate. We also custom designed our range as per required by our client. 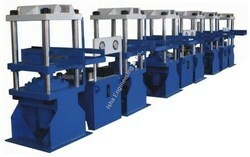 Looking for RUBBER TRANSFER MOULDING PRESS ?